Retirement education you can trust by today’s experts to help you secure retirement. Retirement assets are the name of the game in today’s investment management world. However, registered investment advisor (RIA) firms are now competing with Robo-Advisors and other electronic forms of asset management platforms. A high-touch approach such as expanding your services to include retirement planning and client education can provide needed advisor alpha and solidify your client relationships. We’ve been designing and providing retirement education programs in live workshop and webinar formats for consumers and advisors for 30 years. We will help you design a webinar series from our library of on-demand courses from over 40 leading retirement experts and make it easy for you to cost-effectively reach new and existing clients in different locations, time zones and levels of knowledge. Group events can be scheduled to allow you to interact with a select group of clients at a time, or access can be provided per client to watch with spouses or significant others after work hours. Which topics should be included in a smart retirement education program for clients? Content is more actionable when viewed in order of the topics below to develop a holistic understanding of the retirement income planning process, as well as to increase client participation in the webinars and application of concepts. We will work with you to design a nine-part series based on what you want clients to understand about how to make informed decisions for a secure retirement. How does our Retirement Smart series work? We provide you with a link to an evaluation per course or for the series that clients can complete online. 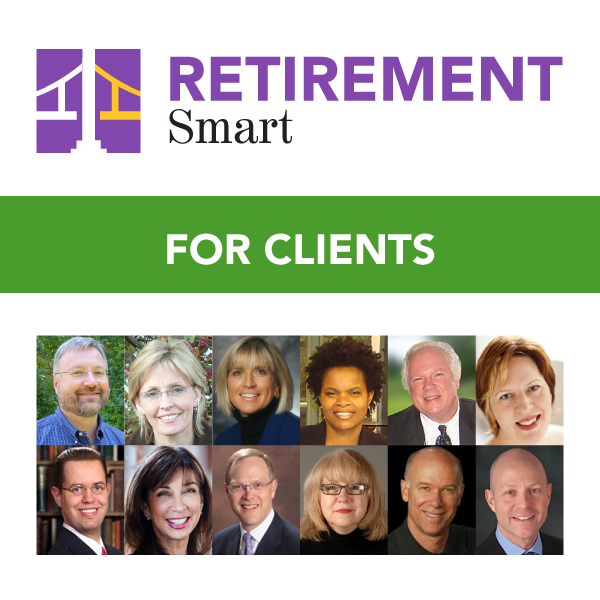 Questions about Retirement Smart for your clients? or calling 847-686-0440 ext. 102.